I bought this armchair in the clearance section of living spaces and paid about 60% of the regular price. It is a high quality chair with a great flexsteel support, so the chair is firm without being too hard. It is just the right size for my small living room and looks a lot like much more expense chairs sold in other stores. 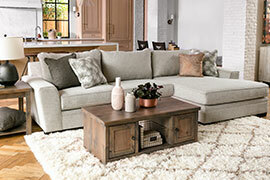 I also love the brown heather color, it compliments my sand colored sectional sofa perfectly. I highly recommend this chair! We bought the complete dining set along with the chairs. We love the color and the finish of this set. Its sturdy and strong, we got this in clearance and so thankful it was in clearance coz its a great steal. One star missing because there is no back rest for the chair otherwise a great product. 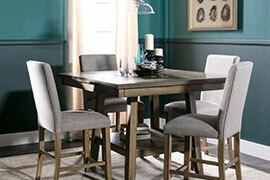 I am in love with this dining set! It is incredibly well made and beautiful! A perfect mix of craftsman and modern. Putting the table together was fairly easy. I put it together by myself in about 90 minutes or so. I bought this as well as the matching bench. 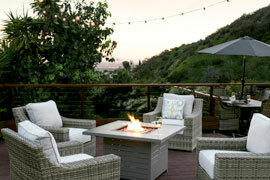 This is a great choice if you want to add more seating to your dinining area but don’t want to take up a lot of space. I loved this table. I was a little hesitant about the bench but I have to admit that’s the best part of it all! Super practical and cute. I would totally recommend if tour looking for a small change. I have always wanted a grey, wood dining table and this one matches exactly what I have been looking for. It's a unique, non-traditional table due to it being a counter height rather than your standard dining table height. Additionally, the square shape just provides a unique spin on it. The chairs a comfortable and the overall look of this table is just beautiful! Can't go wrong in choosing this! This table is awesome for a condo and apartment style living.. also great for tall people. The following reviews are for product "JACOBY GUNMETAL CHAISE"
Not ideal for small space Living room unless this will be main cushion seating. Based on the dimension provided online, it was a bit bigger than I expected (thought it would be narrow for the arm rest part). Single seater and firm cushion to sit which is good for anyone who prefers that like myself. We purchased this for the kids tv room and fell in love with it so much so that we purchased it in the denim color for the living room. Very comfortable, sturdy, and stylish. My mom is thinking of buying them for her house as well. We definitely recommend and would purchase again. The following reviews are for product "GUNNER SIDE CHAIR"
Great Chairs for Dining Set! 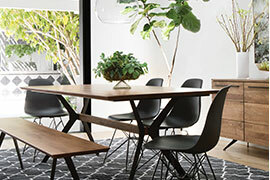 We bought the Collette 88" Dining Table but didn't like the chairs that were on display with it. Looking for something a little more modern, we found the Gunner Side Chair and bam! our decision was made. These have a great mid-century modern look with a beautiful dark grey fabric. These chairs are solid and more than anything very comfortable. Had them for about 2 months. Like the fact they are light weight, easy to move around. The looks is not super nice, and maybe too formal, but once you use them like us in our kitchen you don't think about what they look like. The chairs are very comfortable for the back, great simple lines, light-weight, easy to move. We are very happy with them, their low cost, and they can be easily dis-assembled for storage. Would definitely recommend to anyone who likes simple design, comfort and affordability. The following reviews are for product "FINLEY CHEST OF DRAWERS"
I am in love with my new dresser. It is bigger in my house than what I saw in store. Drawers aren't that deep but a great dresser for the affordable price. 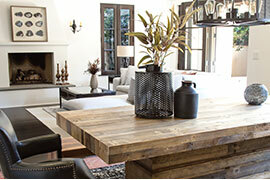 Love the rustic look as well! For the price it's well worth it. Not the best quality by still very nice. I purchased 3 in total. Really liked. The following reviews are for product "HANFORD FILE BASE"
The drawers open and close easily and are very spacious. I love that there are levelers on the bottom of the cabinet. I chose to add the Hanford selections to my home office. I already had a nice desk and this collection had very similar finish. Very pleased with quality and price. 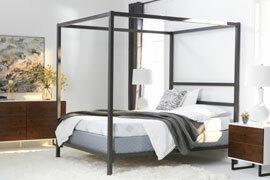 This bed is absolutely beautiful. It's definitely a statement piece, and looks and feels far more expensive than it was. 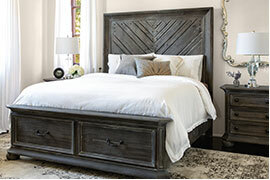 The tall headboard and dark finish creates a dramatic and romantic look. 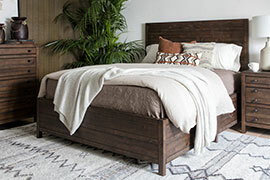 My decor is a mix of modern glam and traditional, however, this bed would easily work well with many other styles, such as rustic decor. At first I was hesitant about this product but I am so so happy I decided to buy it! I was iffy because displays weren’t available and I didn’t want to purchase it without seeing it first. However I decided to take a chance and wow! For the price I definitely got my price worth! The material is really really nice and the bed is nice enough for two. The following reviews are for product "LENNON STEEL LOVESEAT"
We were greeted at the door by a friendly you man. There was no pressure to buy. The young salesman asked us did we need help finding what we were looking for and would be glad to assist us. We paid cash and picked up furniture same day. We are telling everyone to go to Living Spaces in Pflugerville. We absolutely loved the experience. Considering the cost and the comfort, very satisfied with this purchase. Looks great too. 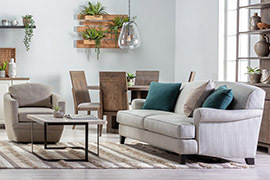 Bought online with matching sofa, everything as described, quality good for pricing. I bought this bunk bed for my granddaughters for Christmas 2017. The 10 year old sleeps on the top and her only complaint is how hard the bed is to make. The 3 year old sleeps on the lower bunk and loves it. It is a really well made cute set. Nice, sturdy bunk bed. However the storage drawer below is very shallow and the drawers are hard to open and close. The following reviews are for product "ASHFORD DINING TABLE"
Got this dining set from the outlet section and can't be any more satisfied with it! Easy to assemble and pickup guys were great at the La Mirada center. Table was reasonably priced and good value. Delivery and set up was perfect. Met our needs. The dining set is lovely. It's a unique color and very well made. Very comfortable They are making me type more words or the system won't accept my rating. It even tells me what words I can and cannot use. 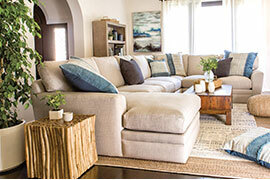 read more Click to read full text of review titled "Great Starter Couch". isn't which is perfect for me. The one downside is that the fabric of the couch is a little firm and not the softest, but I love it. I highly recommend this couch. Most mattress foundations are ugly and have to be covered with sheets. This one was chosen for it's good looking grey fabric, eliminating the need to keep covered. That makes things simple for my son! This mattress is not as plush as the one we tested in the store. Hopefully after some use we hope it will become softer. The following reviews are for product "BENTON RAF CHAISE"
The color and material is very good in my living room. The delivery was on time and the 3 men that delivered has good customer service. I recommend this product. It gives me comfort. 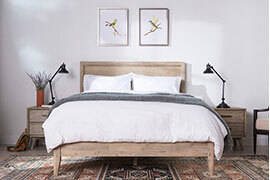 I wanted to purchase a chaise for my bedroom — a place to relax and read. This fit the bill and I love the color. Very comfortable. Delivery was easy. 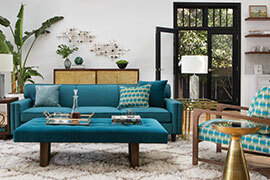 The following reviews are for product "KIT-ARROWMASK 2 PIECE SECTIONAL W/LAF CHAISE"
This is a great sofa for the price! I was expecting to pay much more for a sofa this big and this comfortable. It is very comfortable and fits everyone in our family on it. I really enjoy it! This couch is everything we wanted and more. The sectional layout allows both of us to fully lay out and not be on top of each other. We're both 5'9"-6'0" so that's saying a lot! 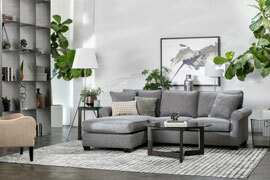 The sectional doesn't overwhelm our one bedroom apartment and the fabric is comfortable and durable. Comfy enough to sleep on when you fight with your significant other! we made sure to get the protection plan too, which is an excellent value. 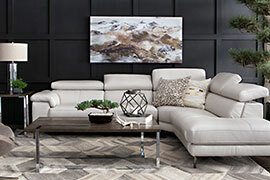 Great price, super comfy, excellent piece for our transitional style. My family liked this product. And anybody who visited the house gave compliments. Love this item. I was worried when other reviewed this item and said the drawers were not straight. The sales person reassured me it was because they put it together themselves. She was correct. We got it delivered already built and everything was perfect.